Our first destination was the Chinese Consulate General located at the Elbchausse. The Elbchausse is a street which is a bit different from most others as it is full of old villas and framed by ancient trees and parks. From there you also have a good view over the river Elbe and part of the container port. The Chinese Consulate General is in one of those huge villas but sadly the area we had to visit was located next to the villa in some small side building. Everything went without problems when applying for this travel document except that they were surprised or lets say confused about the Nathan having two nationalities. After this short visit we headed to the city center for the shopping and of course for some food. To find the right place for our lunch wasn’t that easy even though we passed by many restaurants. The reason behind it was that we spent rather much money on food in the other cities and wanted to keep it a bit more simple this time. Thankfully I had just recently read one blog post by CL (RealGunner) about his Europe trip and eating out well in the train stations. This gave me the idea to find out what Hamburg Hauptbahnhof (Hamburg Main Railway Station) has to offer. Lets just say the amount of restaurants and snack bars is just stunning! Within short time there we found some Asian food for the women and I went to the snack bar right next to it to eat something more German: Currywurst and beer. Though my food was pretty decent the women were not so fond of their lunch, well they had to take again some Asian food and of course it won’t be as good as in China but I guess they will never learn. Now came the prime time for both MIL and my wife as we headed to Mö (Mönckebergstraße) one of the main shopping streets in Hamburg and with enough stores to keep MIL busy for a few weeks. At this point I need to say that crazy mother-in-law had some bad day or something similar as she lost her shopping mood after just a few stores, something what had never happened before. This gave me the opportunity to take them a bit around the city center to visit some tourist sightseeing points. The first place I took them was the Hamburg Rathaus (Hamburg Town hall) which is a very impressive building. On that day there was some kind of event as the plaza in front of the town hall was filled with a South German styled market offering food and drinks from that region. 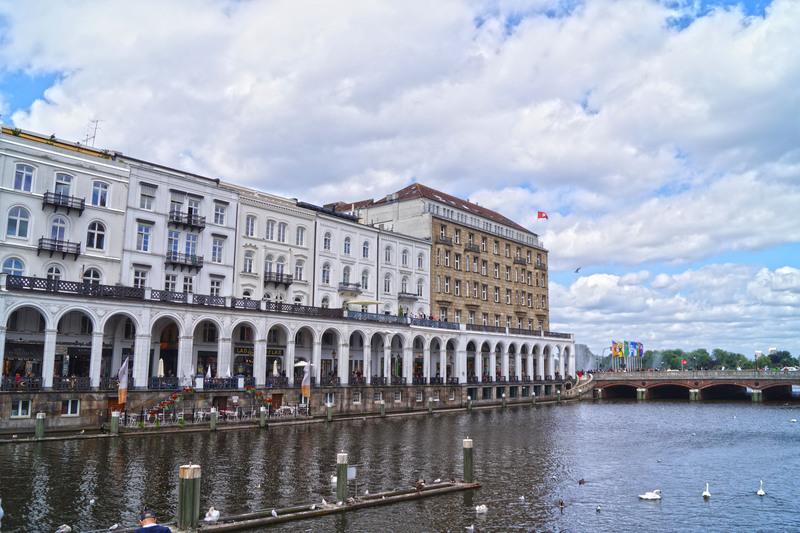 The town hall is located next to the Binnenalster another tourist spot and of course leading into another shopping street, Neuer Wall. This shopping street is full of those luxury stores and MIL was going around video taping everything. This is just her, filming a shopping street even though the same stores she can also visit in Xi’an. From the shopping street I took them to the Finnish Seamen’s Church in which Nathan and me were baptized. There we had some Finnish snacks and drinks and went on to our last destination the Landungsbrücken/ St. Pauli Landing Bridges. Back in the day big oversea ships landed at those piers but these days only the harbour cruise ferries and some other small vessel are stopping there. By now both women were exhausted from this little walking around and wanted nothing more than heading back home again and thus our few hours in Hamburg ended. Just two days after this trip we drove to Hamburg again but this time it was to send MIL to the Hamburg Airport for her journey back to the east. Have you tried before to do a sightseeing tour with only a few hours time in a big city? And indeed the currywurst was good. I dont know ifs due to the fact that I was so hungry or that the food was really good. I heard good things about Hamburg from my partner. I actually find it tougher to be in a foreign country and not knowing the language, to squeeze in touring time for a few hrs. in a city/town. I guess it’s my lack of natural wayfinding skills that holds me back. By the way, my partner is hosting and entertaining relatives, a couple from Dusseldorf for the past 3.5 wks. in Vancouver. He finds that they don’t eat much, they don’t care for sushi/sashimi. They’re not adventurous eaters. They want to see British Columbia’s ocean coast line with temperate rainforests. It always depend on the people how adventurous they are. My mother for example does not like to try anything new so her trip to China a few years ago was really tricky. huge…you got that one right about Canada. I would really like to see an excerpt the films from your MIL filming the high end stores. Do you think she watches them when she gets home, or maybe shows them to her friends to brag about it? Hamburg is a beautiful city! I really wonder if she watches all those videos she has been taken during those three months! What? Your MIL got sick of shopping? That’s strange. Hamburg looks like a place where I could enjoy sightseeing for hours, for a couple of days even. I am not surprised Nathan is a dual citizen. My friend’s daughter has dual citizenship for Taiwan and Canada. 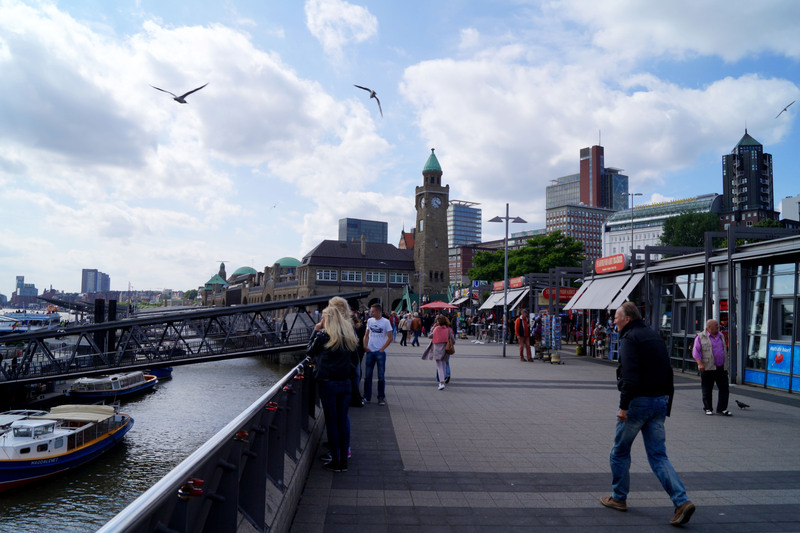 Hamburg is the second biggest city in Germany with a rich history. The name itself is coming from ‘Hammerburg’ which roughly translates into Hammercastle. Of course there isn’t any castle left but each part of the cit got its own history with wonderful buildings. Hahaha. Incredulous MIL got tired of shopping for once. Maybe it was too crowded and she wasn’t in the mood to push with people that day. I hope she held the video camera well and the videos didn’t turn out too shaky. Maybe she kept the video on Nathan most of the time. The train station looks massive. So many food shops. Definitely much more bigger and more choices than the train stations in Melbourne. Need to try those next time in Hamburg, perhaps already tomorrow as I need to pick up my visa for China. AGggg! Why does MIL and your wife insist on finding Asian food in a German city? 😛 I didn’t go near Asian food when I was in Austria. Why? The food was sooo good. I can’t imagine ruining it with food that is the best back home. Surely there is something they will like that is German? Hamburg looks so lovely. I’m brimming with envy. Which reminds me, yes, I tried to see Boston, MA in just a few hours and it was impossible. But I loved getting a taste of this historical city. Hmmm. Must think of a way to get her to try different food. Maybe get her drunk first. Hahahahhaa. Hamburg looks lovely! German train stations are so beautiful, this one reminds me of Köln. 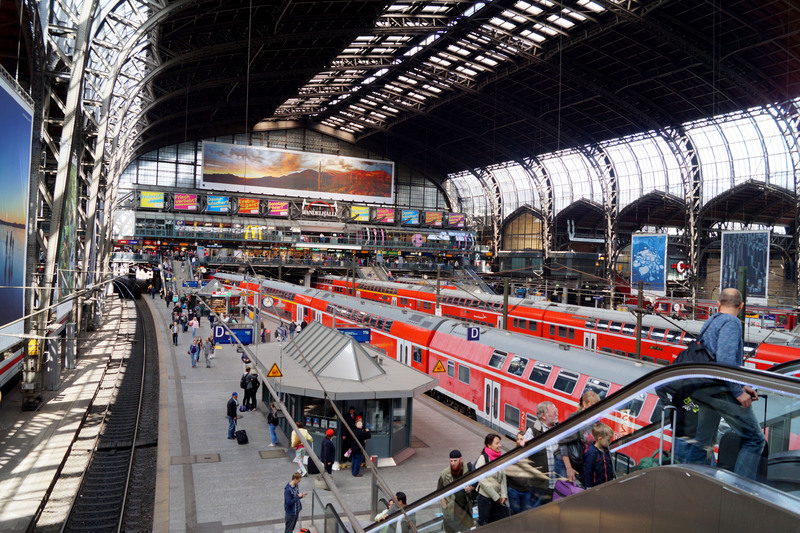 I havent been myself in Köln station however I think that in most major German cities the train stations got the similar “design” from back in time (Hamburg opened in 1906!). I know that in Berlin, Chemnitz, Leipzig and Frankfurt the stations are pretty similar and I bet they are from around the same time before the first WW. And, hey, thanks for the linkback!